In 1970, the year that Dr. Anderson left the UCA faculty, Mr. Clyde Penny and Mrs. Marian Ross, both African Americans, joined the UCA faculty. Mr. Penny was an instructor in The Center, and Mrs. Ross was the chairperson of the newly created Department of Occupational Therapy. Mr. Penny was at UCA for only a short period of time, but Mrs. Ross was at the helm of UCA’s Department of Occupational Therapy for 21 years. Mrs. Ross attended Philander Smith College in Little Rock from 1945 to 1946 and received her Bachelor of Science in home economics from Central State College in Wilberforce, Ohio in 1949. She received her Master of Arts in home economics in 1951 from the Teachers College of Columbia University of New York. In 1957 she received her Occupational Therapy Certification from the College of Physicians and Surgeons of Columbia University. During 1966 and 1967 she was engaged in doctoral study at Ohio State University and she continued her doctoral work at the University of Arkansas in 1980. Sciences, 1975 to 1977; Associate Professor and Chairperson of the UCA Department of Occupational Therapy from 1970 to 1991. Even though Mrs. Ross was not the first African American faculty member at UCA, she was the first African American to serve as a department head at UCA. She became chairperson of the Department of Occupational Therapy in 1970 and served in that capacity until June 30, 1991. 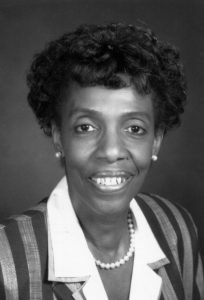 In addition, she was elected president of the UCA Faculty Council during the 1978-1979 academic year, making her the first African American to hold that office. The Faculty Council was the forerunner to the UCA Faculty Senate. When asked about Mrs. Ross and her role as being the founding chair of the Department of Occupational Therapy, Dr. Neil Hattlestad, Dean of the College of Health and Behavioral Sciences stated, “She came to us from Ohio State University and was the perfect choice to mount this program, which continues as the only one of its type in the State of Arkansas. She was thoughtful, well-liked and excelled in organization.” After Mrs. Ross retired, a street that runs through UCA was named in her honor, Marian Ross Avenue. Mrs. Ross passed away in November 2001. Contributions to the Marian Ross Scholarship Fund may be made by clicking on this link!